WASHINGTON (CNS) — The culture wars show no sign of abating in 2014. Not only is there likely to be sharp disagreement on many of the hot-button social issues as the midterm election cycle approaches, Americans are also increasingly unable to agree on the past. Specifically, how we got here. A Pew Research Center study issued Dec. 30 showed a deepening partisan divide about whether humans existed in their — our — present form since the beginning of time or whether they evolved. And, if they did evolve, whether God guided the process along. The results of Pew’s survey, taken by phone in March and covering 1,983 adults, found that 60 percent of all Americans believe humans evolved over time, while 33 percent said humans have existed in their present form from the beginning. Parsed by party affiliation, though, the survey shows a deepening rift. Democrats, by a 67 percent to 27 percent margin, support the evolution stance. This is an increase of three percentage points from 2009, when the percentages were 64-30. Political independents were 67-27 in favor of the evolution argument in 2009, although those numbers nudged gently away from that direction in the 2013 survey, to a 65-28 margin. Neither the Democrats’ or independents’ shift is statistically significant. Republicans, though, show the biggest difference. In 2009, there was a marked preference for the evolution position, 54-39. Today, though, only 43 percent identify with the evolution stance, while 48 percent are in the from-the-beginning camp. What brought about this shift? Some clues may be detected from other demographic data collected by Pew. Older Americans tend to identify more with the Republican Party than do other age groups. In the telephone survey — which had an error rate of plus or minus three percentage points for the entire sample — Americans age 65 and older were the least likely to support the evolution theory, although a plurality of 49 percent backed it, as opposed to 35 percent who rejected it. White evangelical Protestants, who are more closely aligned with the GOP, overwhelmingly supported the position that humans have existed from the beginning of time, with 64 percent holding that view, while 27 percent back evolution. Black Protestants were the only other faith group to hew to that belief, although the numbers were not nearly as dramatic, 50-44. Where do Catholics come down on the question? Sixty-eight percent of white non-Hispanic Catholics are on the evolution side. 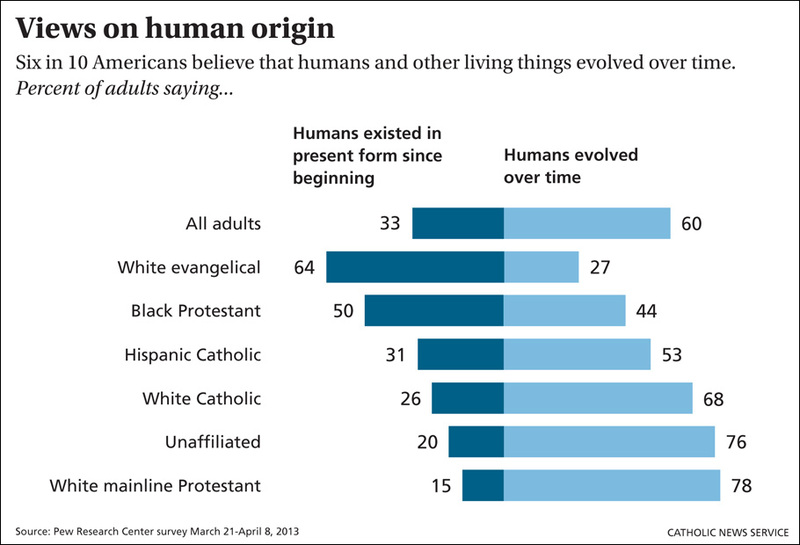 As for Hispanic Catholics, 53 percent said humans have evolved over time, while 31 percent reject that idea. “We knew from 2009 there was a strong affiliation between religious beliefs and views on evolution, so we wanted to see where things stood today,” said Cary Funk, a senior researcher for the Pew Research Center. In an interview with Catholic News Service, Funk used the word “evolve” to describe the change in public opinion on the question. “The views among all Catholics regardless of race or ethnicity have evolved over time,” she said. Catholic teaching on evolution does not make belief in evolution a requirement of faith, but neither is it considered sinful to do so. “New knowledge leads to the recognition of the theory of evolution as more than a hypothesis,” said Blessed John Paul II in a 1996 message to the Pontifical Academy of Sciences. The convergence of evidence from independent scientific research “is in itself a significant argument in favor of this theory,” he added. Without taking sides, the International Theological Commission discussed in a 2004 document whether “intelligent design” — which holds that science can prove that there is a design and purpose inherent in life forms — is a scientific alternative to evolution. It notes that science, not theology, needs to resolve this debate but that neither position is incompatible with faith. The commission was headed by Cardinal Joseph Ratzinger, who in 2005 became Pope Benedict XVI. Both statements have their roots in Pope Pius XII’s 1950 encyclical “Humani Generis,” which said that evolution was worthy of scientific study and could be compatible with the Catholic faith. The issue has been roiling in one form or another since at least the 1925 trial of John Scopes for breaking a Tennessee state law forbidding the teaching of evolution, so any look ahead will also require a look behind.